New Tiburon Forum : Hyundai Tiburon Forums > GK Performance (03+) > I4 - Forced Induction > First turbo project. After reading a lot of things on here and waiting for the opportune moment, I bought a evo turbo setup from another member on here, and I'm finally putting it all in. Previously to this, I upgraded to a stage 3 ACT clutch, fidanza flywheel, changed my spark plugs and wires, and had a local shop install the AEM FIC. 2 weeks ago the roof of my house was being fixed and I didn't work, so it was a good time to start the project. Removed the old exhaust manifold and exhaust, moved the power steering out of the way, and replaced the old oil pan with one that's already tapped. Eventually I was able to mount the new evo exhaust manifold and turbo. Next task - run oil and coolant lines, and mount intercooler. Where does everyone connect their coolant lines, and what advice would you give me for mounting the intercooler? Mine's an 07 btw. Looking good! I plan to do the exact same eventually so I'll be keeping up on this to see how things go. One thing I always ask people with the Evo manifold, how much modification did it require to bolt up? Are you getting rid of power steering or remounting it somehow? "Broken things break other things." Thanks!! I got the manifold from another member on here who had it on his car. He said that he had to move one of the corner holes slightly but that's it. With his modification, it mounted perfectly to the block. I moved the power steering out of the way temporarily, but I think it'll be able to mount back on the original spot with no issues. Didn't have much time today but I more or less figured out how the intercooler will sit and how the pipes will run. The intercooler to throttle body will go under the battery. Seems like the simplest option. Going for this but in a hyundai accent, so my clearance and all will be completely different than everything people have done. Cool, thanks for the info! The intercooler update is looking good, can't wait to see this done! Mounted the intercooler with brackets from the bottom, and I'll probably attach it to the bumper from the top to make it secure. Finished running all the pipes, redid the JB weld on the oil pan tap, and ran the oil line to it. Attached my old Fu5ita intake to the turbo, which worked out surprisingly well. KelConquer and dominicantibby like this. Trying to mirror your progress, just got my little setup. Did you ever find out how or where to run the coolant lines and etc? Also, what downpipe are you going to use? I found a 3" on ebay for the evo8 for 90$..dont know if it'll fit though. I also have a 07 hyundai accent so things might be completely different than your car in regards to space. ALSO how many bends did you have to get to fit the piping to fit? Last edited by CORNERS; 12-23-2014 at 01:02 PM. I took it to a shop to do the exhaust and tune, and they strongly recommended not running coolant lines at all, so they removed them. Not exactly sure where the downpipe came from, the guy who sold me the kit had it. As for the rest of the piping, I made it work with the parts I got from the same guy. Small update. The tune didn't exactly happen. After we had the car strapped to the dyno they realized that the shop's owner's laptop that they used for tuning wasn't there. After lots of apologies they gave me colder plugs and gapped them, and did a few pulls. 225 whp without a real tune. Sometime soon I'm going back to get a real tune. For the time being, the car is drivable, and I don't push it too hard or shift above 5k. Something interesting that's happening is after about 5 miles of driving, the oil light comes on when I'm idling or only pushing the throttle gently. Anything above 50% throttle and the oil light goes off. Any ideas? Where is the sensor and what causes it to come on? The pressure is holding steady at 75psi during driving and about 30-40 psi at idle. No leaks anywhere. Also, I need to rethink my exhaust plan. For now there's a cheap muffler after the downpipe just so I can get around. But because of the bad muffler and running rich, my car smells like gas and exhaust. Do most aftermarket exhausts come with a cat or do I need to get one separately? I can't have the whole thing smelling like crap. stepping on the throttle your making it work harder.. Another possibility is making sure you have a proper feed line to the turbo..
Good luck! very interested in your build! I know the feed lines to the turbo are good. Hopefully the oil pump is not going bad, but right now that's the most likely explanation. What about a cat from something like an evo? you guys think that would work? I know it'll restrict exhaust flow but I really don't want that smell in the finished product. corners: it was either 5 or 6 psi, can't remember for sure. great, 225whp is a pretty decent number for that psi and a slight tune. Was hoping for 300 rated @ 10psi. Not sure if that'd be too much for the transmissions though. If you really want to keep the cat then you'll want one of these..
Found this universal one for $75. 3 inch in and out so that should fit me perfectly. I know anything past 300 hp and the internals will need to be upgraded so that's not something I want to start messing with right now. I think if I get 270-280 I'll be perfectly happy. This is my daily driver so I don't want to go crazy, plus I need it to be reliable...ish. LOL. Actually thats a better deal!! Do you have a wideband already? 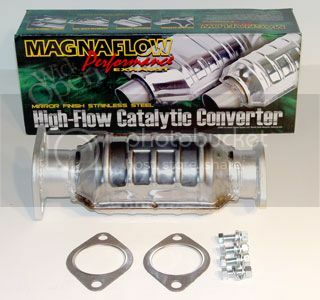 If you dont whenver you take the high flow cat to the shop to get it welded it would be the time to get the bung welded in place for it..
Magnaflow products is some good stuff for a good price.. Don't go on ebay and price out anything else. Your on the right track! Are you SURE the gauge is correct? Maybe add some piping & a "T" to have an additional mechanical gauge installed so you can compare them. Varying oil pressure is common, as the revs build, the pressure goes up. Part is the pump, part is the "leakage" through bearings can't flow oil fast enough out of them and the pressure rises. Most "idiot light" sensors are on/off, they don't vary. Oil pressure usually doesn't trip until ~8PSI or less. By then, you've likely hurt bearings. Where is the gauge sending unit tapped into the oiling system? Is it the same spot as the idiot light sender? Ok so one thing I figured out is my dumbass didn't connect the battery terminal positively enough the last time I did it so that was causing a bit of an electrical problem. Oil pressure didn't drop below 25 psi on the gauge so the dash oil light shouldn't be coming on, and yet it's still happening. No oil leaks though. That's why I'm confused. Where is the sensor for the oil light located? I made an appointment to get the tune Saturday and they said to bring my own laptop so I can keep the maps and everything. While trying to connect, I ran into an issue. Does anyone have the drivers by any chance? I looked around but everyone is pointing to the old AEM forum that isn't around anymore. If you havent figured out how to run your coolant lines, heres what I did. I did the throttle body bypass mod and ran my coolant lines from the back of the head where they used to plug into the throttle body. Works perfectly. Current mods: AEM FI/C, 577cc SRT4 injectors, 4G63 tubular manifold, Garret GT25R Turbo, Custom Downpipe, FMIC, OBX-R Catback exhaust ,Magnaflow high flow cat, F1 Racing Stage 2 clutch/flywheel combo, Slave Cylinder mod, H&R Lowering Springs, Fidanza STS, Jattus Torque Damper, Polyuerthane Motor mounts. Project turbo is complete! Finally got a tune!!! It's making 248 wph at 6 psi. The only things left to do is exhaust (next Tuesday/Wednesday), and put my coolant overflow tank somewhere and put the front bumper back on. Checked the oil pressure sensor connection and it looks fine. So I think it must have come unplugged from the gauge. Either tonight or tomorrow I'll pull the gauge pod back and reconnect it. This is dope! Didnt expect 6psi to give that much power. Definitely cant wait to finish this kit now!